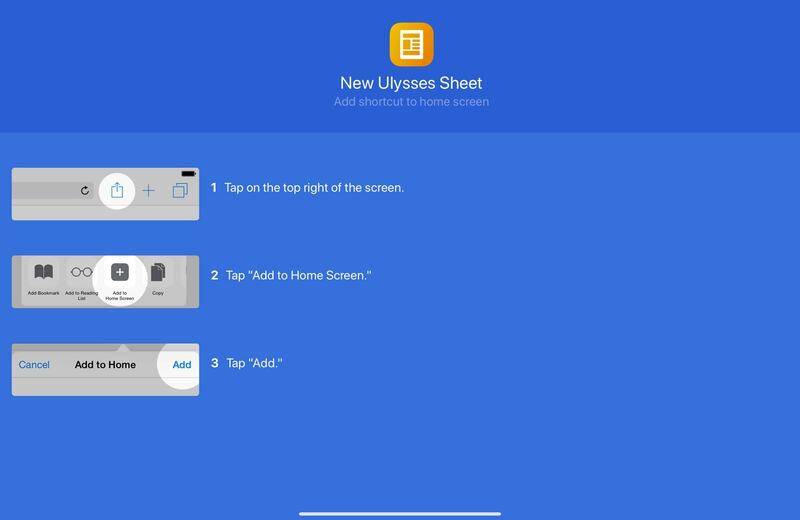 The idea is that you dedicate your home screen to actions, instead of apps. Instead of opening up the Mail app, then tapping compose, then entering an email address of your boss, you can just put an icon on your home screen to launch a new, blank email already addressed to the boss. What is this evil magic? Instead of opening up the music app and searching for that chilled playlist you like to listen to while you work, just put an icon for it on the home screen. Do you often create reminders throughout the day? Create an icon that pops open a panel into which you can enter a note, and an optional reminder time. The list of possible actions is almost endless, because you can add any shortcut to your new Actions Home Screen. 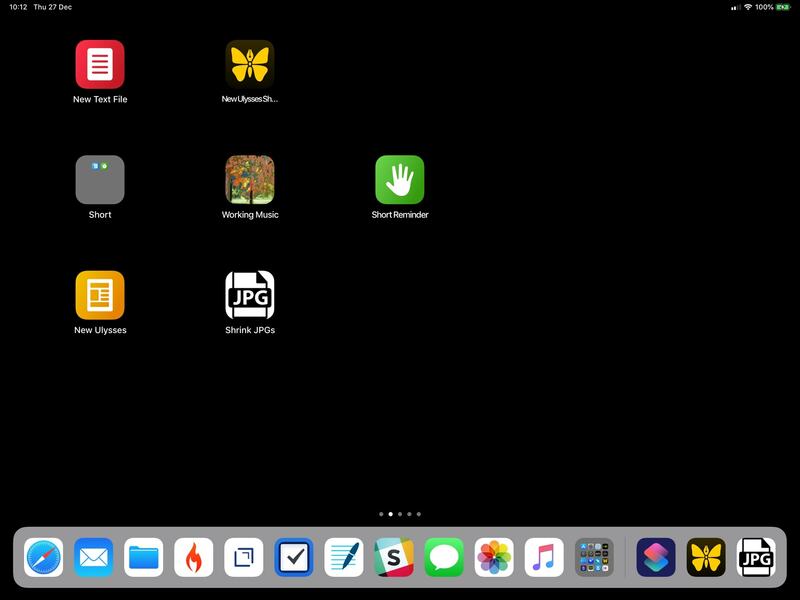 You might like to run this setup in conjunction with the blank home screen, and use this blank-spaces hack to organize the other icons. This is all possible because of a neat feature of the Shortcuts app. 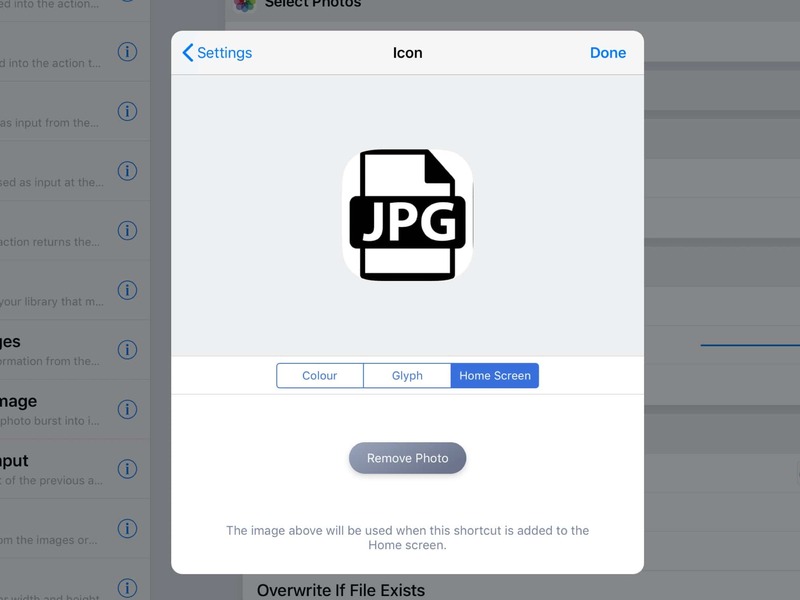 It lets you add any shortcut to the home screen, with a custom icon. Tap the icon to run the shortcut. It’s dead easy to do, but it does have a downsides: Whenever you tap the icon, the Shortcuts app opens up and shows you the shortcut as it runs. If all you want to do is launch an app to a new, blank document, for example, this is messy. Still, it’s better than all the tapping and swiping you have to do currently. If you really hate this behavior, you can use the Today View widget instead. When launched from the widget, some (but not all) shortcuts will run invisibly, in the background. I haven’t yet managed to work out the criteria for this silent running, but it’s great when it does work. I still prefer the home-screen version, though, as it’s a single swipe (or home-button tap) away in any app. In the image above, you can see my current home screen setup. It’s pretty bare, as I prefer to add items as I need them, rather than all at once. That way I never get lost, nor do I spend ages searching for the icon I need (which kinds of defaults the point of this hack). Step one is to create a new shortcut, or choose one you made already. I’ll whip up a quickie that creates a new blank Document in Ulysses. 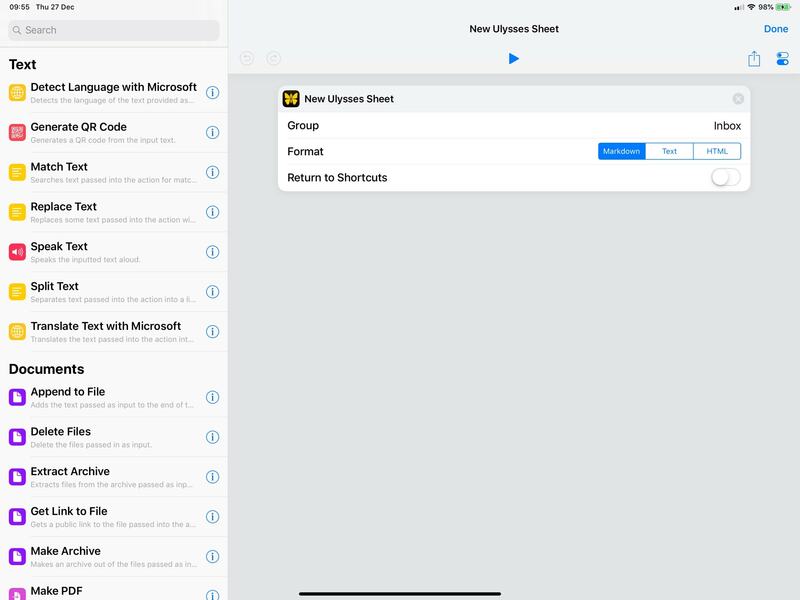 Then, in the Shortcuts editing screen, you can just choose to save the current shortcut to the home screen. Tap this to save an icon to the home screen. This opens Safari, from where you can add a bookmark to the home screen. 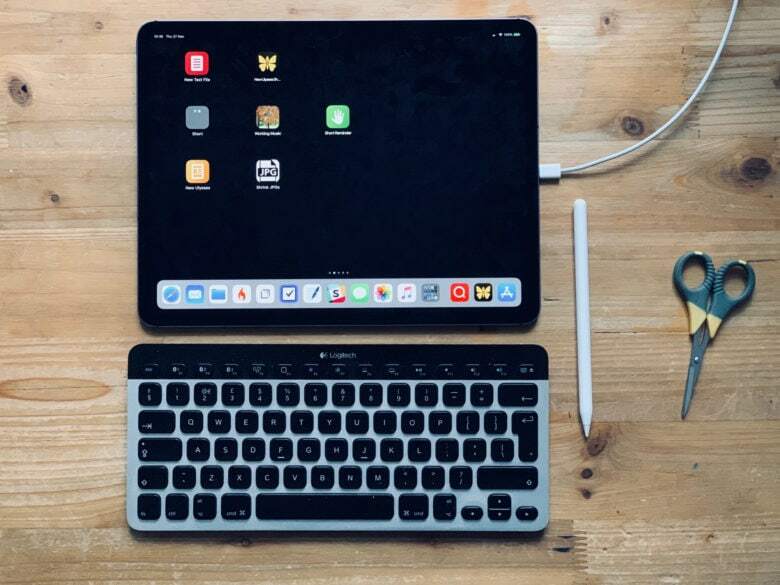 It’s an odd kludge considering that Shortcuts is now owned by Apple, but is understandable as an artifact of Shortcuts’ origins as a third-party app called Workflow. 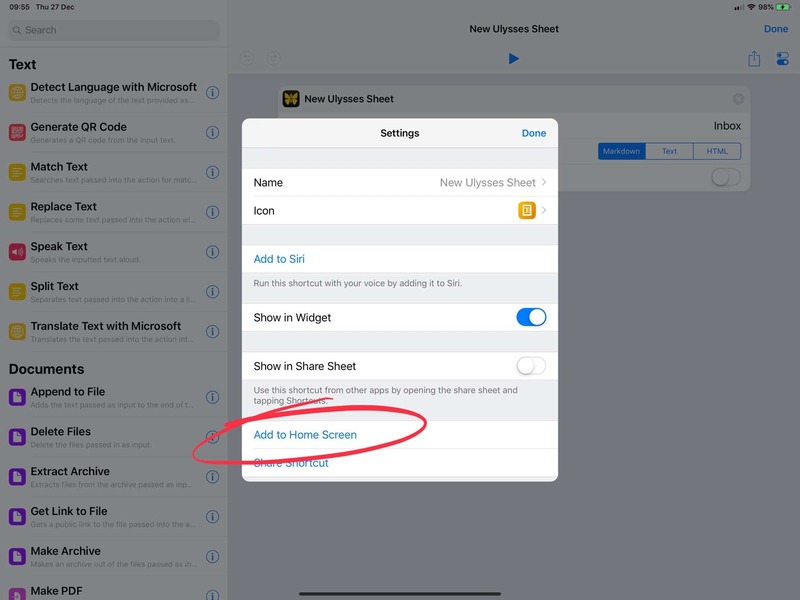 Shortcuts uses Safari to make the home-screen links. Add a custom icon to your shortcut and it’ll be used as the home screen icon. That’s it. Start with a few of these and see how you go. I have actions to create a new document, to create a reminder, to play a “work” music playlist, and to let me pick a bunch of recents images, resize them, and add them to my Gladys shelf app. I’m also planning on one to quickly create a message to The Lady. Let me know if you come up with any great actions.